Business Partner Master data configuration is required for configuring settings specific to SPS Trading Partners (SAP Business One Customers). 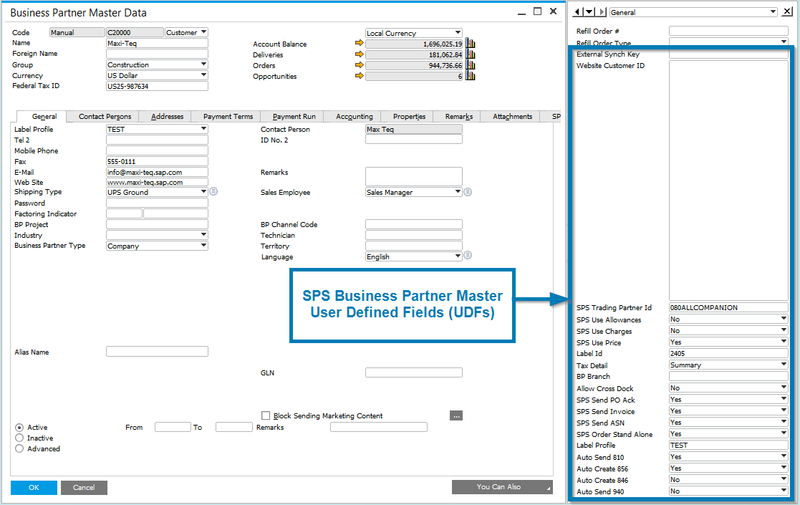 Refer to the screenshot below for definitions of User Defined Fields (UDFs) used for the configurations specific to SPS Trading Partners (SAP Business One Customers). Business Partner Master Data UDF info. Internal field. Do not use. Number assigned by the buyer that uniquely identifies the vendor. Unique internal identifier defined by SPS Commerce which identifies the relationship. Yes – Use Allowances in the SPS Purchase Order (850). No – Do not use Allowances in the SPS Purchase Order (850). All Allowances will be taken from SAP B1. Yes – Use Charges in the SPS Purchase Order (850). No – Do not use Charges in the SPS Purchase Order (850). All Charges will be taken for SAP B1. Yes – Use Prices in the SPS Purchase Order (850). No – Do not use Prices in the SPS Purchase Order (850). All Prices will be taken from SAP B1. Yes – Enable sending PO Ack to Trading Partner (855). No – Disable sending PO Ack to Trading Partner (855). Yes – Enable sending Invoive to Trading Partner (810). No – Disable sending Invoice to Trading Partner (810). Yes – Enable sending ASN (Advanced Shipping Notice) to Trading Partner (856). No – Disable sending ASN (Advanced Shipping Notice) to Trading Partner (856).